As a small organization with a big mission (enriching the world by disseminating the words of the Buddha) Pariyatti receives support from invaluable volunteers, or Dhamma servers, to be able to offer its services. In past newsletter issues we reported on the Art of Reading Dhamma Books and the production of the film ‘Seeds of Awareness’. This time we want to shed some light behind the scenes of the Pariyatti Learning Center (PLC). We asked Klaus Nothnagel about what’s involved in creating these helpful online tools for studying Pāli. Below is a report of the information he sent us, giving an unexpected and wonderful insight in the olden days as well. Klaus started practicing Vipassana in the early 1970s with Goenkaji and studying Pāli in the late 1980s, and in hindsight it was an experience in his very first course that became the cornerstone for his affinity with and interest in Pāli. Many Vipassana meditators look back on their first courses thinking they slept more hours then the course schedule technically allows, and Klaus shared with us it was the same for him. Dhamma works, and fortunately Klaus was able to join that first Pāli course. It was there that he met Sean Salkin, who—like Klaus—is currently one of the teachers conducting Pariyatti Pāli workshops. Especially in those days India was not a country known for its efficiency, and the Pāli students ended up serving at Dhamma Giri a lot more than studying Pāli. 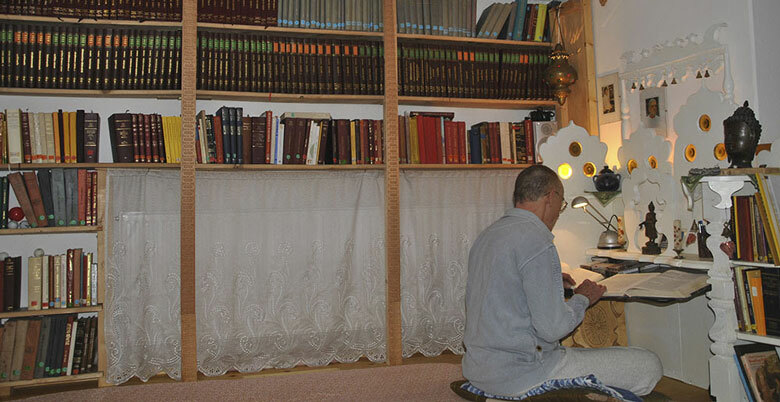 Dhamma Server Klaus Nothnagel references Pāli Texts in his dedicated 'Pāli corner'. While back in Germany in 1997, Klaus was informed that Goenkaji wished for Pāli courses to be available around the world and asked Klaus to start conducting Pāli workshops. Although hesitant at first, Klaus prepared some simple material and the first three-day Pāli workshop was held at Dhamma Geha, the then German Center. (Nowadays Vipassana Centers are dedicated to meditation practice and Pāli courses are held at off-center locations). When the sabbatical was introduced in Germany, Klaus and his wife—together conducting Vipassana courses by then—were able to join the first 45-day Pāli workshop by Tandonji, conducted at in a site adjacent to Dhamma Salila. Tandonji expressed that the material prepared for the Workshop had been chosen at random but that he wanted a more systematic approach. He asked Klaus to research, select and place suttas in a suitable order, explaining the Eightfold Noble Path. “It had already been my intention to find all the suttas that Goenkaji refers to in the 10-day and long-course discourses (as in quotes like ‘from darkness to brightness’, ‘so difficult to encounter the teaching (dullabho)’ and stories such as the one about Thera Mahātissa of Cīragumba, who kept high sīla, even when he was dying of hunger surrounded by mangos)—so I had a double task,” Klaus said. At that point Klaus was not working on the creation of the online PLC yet, but his research let to a selection of suttas in the order as it is found now in the online course Exploring The Path (ETP). From all the material gathered over time Klaus said it became clear that only the simpler texts could be used for the residential workshop. The idea developed to make use of the rest as well; originally to publish it in a book. 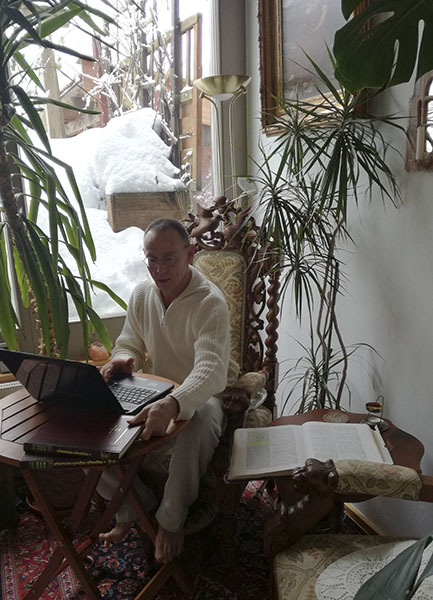 Klaus knew Rick Crutcher, Director of Pariyatti at that time, from when he was at VRI, India, as Rick had finalized the editing of the Satipaṭṭhāna Sutta translation (together with Patrick Given-Wilson) and he contacted him about publication once he had material ready to be published. But Rick was quite aware of the digital age and proposed to present the material in a digital format, suitable for online learning, including introductions, vocabulary-tools and audio. “The whole project turned into something much more challenging and demanding,” Klaus said, explaining that this had meant he'd had to learn to use various software and recording hardware as well. “I am not a PC-wallah!,” he said, “But it actually turned out to be more fun even, as by researching introduction material I come across a lot of texts and information I would have missed otherwise! The course material initially uploaded on the PLC took nearly three years longer to finalize than initially planned, due to the extra tasks mentioned above, Klaus said. The PLC was finally launched around the full moon of July 2011, marking the anniversary of the start of the Buddha's Teachings (when he gave the Dhammacakkapavatana Sutta). The PLC currently offers three different free online courses; an ‘Introduction to Pāli’ course, an intermediate Pāli course – Exploring the Path- and a course called Buddhasahassanāmāvali that uses verses by Vipassana meditation teacher S.N. Goenka as the basis for learning Pāli.